Let us apply that law of bibliological psychology to the question hinted in the title of this short article and we shall be bound to acknowledge that we may judge of the psychical type of Russian readers of Elisée Reclus, by their attitude towards the works of this illustrious author and vice versa. By his mind, Elisée Reclus is synthetic: synthesis is always predominant over analysis in his works. Reclus is emotional: he writes of feelings, warmheartedly; all his works are replete with intellectual feelings, as psychologists call them. Such feelings of beauty, ardent love of truth, and its search, finally a cosmic feeling-let us only remember the preface of the author to the first volume of his work, "La Terre". But it is not all: Reclus' works from the first to the last page are impregnated with feelings of social justice, of the highest humanity, and other highest ethical and social feelings. Reclus is a thinker and a scientist but not an abstract one: he thinks not in abstract ideas, but in brilliant images; convertibly as an artist, painter or poet; his descriptions are brilliant pictures. Reclus is full of ideal tendencies; if we may say so, he is not only a learned investigator, but a learned dreamer, if not, he would not have been an anarchist, and would not have poured into anarchism both so much knowledge and so much humane idealism. Finally one more psychical peculiarity of this author -- all this can be seen from the style and generally from the text of his works: Reclus is integralist: he takes man and society, humanity and the universe, in their entirety, all together, indivisibly, synthetically, integrally: all this is for Reclus not some sort of mechanical and physical mixture, or the sum of various things and beings, but a chemical combination of them all into one indivisible whole, and in this integrality they not only complete each other but they are not discernible one from the other: If any of these elements disappear--then from their disappearance their chemicals combine into one whole, and their moveable equilibrium is altered. Let us take these and only these qualities of Reclus and leaning on our psychological and statistical studies of the Russian readers belonging to various social classes between 1888 and 19243 we venture to say that all the above mentioned qualities of Reclus and his works are also the psychical qualities of the Russian people in their masses. We mean here the Slavonians of Grand Russia and also the Ukranians and White Ruthenians who are much the same as the Grand Russians. The Russian reading public is not fond of and scarcely read books of analytical type, i.e. analysing any questions. We Russians prefer synthesis to analysis, induction to deduction, concrete to abstract ideas. We even dream realistic ally, and therefore, the same ideals which in the West are considered as extreme and very distant, are taken by us as if they were immediately realisable. If sometimes it seems in the eyes of a foreigner that such analytical, deductive and abstract authors as E. Kant, John Stuart Mill and Hegel are or were well-read in Russia, that deduction is not exact: It is impossible to judge the popular reading masses, of the wide or large Russian public by the Russian intelligentsia comprising or having comprised, especially in the 1sth and 19th century many allogeneous elements formed into a Russian aristocracy by the czarist system. It was not until the liberation of the serfs in 1861, that the Russian aristocracy began to be turned from nobility into real all Russian intelligentsia, and even now the intelligentsia contains a considerable percentage of allogeneous people, especially Jews and Germans, belonging to psychically different types, not resembling the psychological type of the purely Russian masses. One can see this immediately when one compares the ordinary Russian reader, with, for instance, the Jewish reader, a nationality far richer in men with analythical, deductive minds. From our own investigations, to every hundred pure Russians there are 13% of analytical minds, while with the Hebrews there are 46%. From what we have stated above, we see that Reclus could not but be one of the authors who met with the warmest reception among the Russian reading masses. According to the above-mentioned bibliologico-psychological law, of Hennequin, the author who exercises the strongest influence on the psychical organization of the reader is the one whose psychical organisation is nearest to the psychical organisation of the latter. This is confirmed by facts and the history of the translations of Reclus' classical works into Russian and by library and book-shop statistics. The awakening of the Russian intelligentsia crushed from 1881 to 1892 by the iron heel of Alexander III took on even during the famine, a hitherto unknown oppositional and afterwards revolutionary character. The revival of the intellectual society could not but lead to a revival and enlivenment of the Russian press and the publication of books. The Russian reading public belonging to the intellectual classes took to seeking and demanding such books, which could inflame the public mind, and especially prove all the justice of the ideals which were totally opposite the ideals of czarism. Visibly more and more books both old and newly edited were read which satisfied such requirements; they issued from that oblivion; they were in request both in book stores and in libraries. Then came the turn of the works of Elisée Reclus already translated into Russian; his popularity grew apace. I too had to work in that direction. When I was an upper school boy and an undergraduate at college, I had to work in my mother's public library in St. Petersburg.4 Like many of my comrades, I was already enthusiastic over the bright ideas of a complete change in the social status and the construction of a new world based on general work, justice, liberty and respect for love of every human personality. The ideas of Elisée Reclus, so brilliantly exposed in the last chapters of the second volume of his "Earth" were already then my ideas, and I resolved with the ardor of youth to do most energetically all I could to circulate them, not only among my comrades, but also among the librarians, in the factories, among the workingmen, in the midst of whom I lived from 1887 to 1892. I did the same in my articles, which then began to appear in various magazines. As I worked in the library, it was easy for me to observe that Reclus' works, which up to 1892 were hardly ever demanded, by the subscribers, began to be more and more in request. This increase of demand, led me naturally, to the idea of republishing the classical "Earth" at a more reasonable price. As I look back, I cannot help considering the very idea of republishing that work as foolhardy, for such a publication required a great deal of money, and moreover, at that time in Russia were published for the peasants and workingmen mostly only pamphlets of 16-80 pages of small size, hardly ever containing scientific works or even popular exposition of scientific facts. At that period the number of learned people or even those able to read were shamefully small. The proportion of people able to read was 10 to 12% of the rural populations, and a very little higher in the Capitals of St. Petersburg and Moscow, and in large towns. Nevertheless, in spite of all obstacles, which the czar's government opposed to the progress of education, the people and the educated portions of society, and the zemstvos also worked zealously to spread as rapidly as possible education amongst the working classes. In the library and in the factory where I was working, it was felt that the works of Reclus would find clever readers, also in the broad circles of society. For this it was necessary first to publish Reclus in cheap editions and therefore in a large number of copies; and secondly to make Reclus' works more interesting and attractive for the Russian readers, comparatively not very well informed and for this purpose to provide the books with as many illustrations as possible. An edition of Reclus thus organised, thought I, could be really within reach of all, and therefore would penetrate into wider strata of the Russian reading masses, and Russia would then know the great wrestler for truth, justice and humanity. Such was the plan evolved from the observation of the Russian readers belonging to the various layers of lower classes. Beyond all expectations, I succeeded in carrying out this plan. A Russian lady, Olga Popova, a very learned and wealthy woman, invited me to become the head of a great publishing firm, she intended to start to promote the cultural struggle against czarism and generally against the injustices of the Russian State organisation. Of course, I gladly accepted that proposal, but the task was difficult and dangerous; the fate of the wole undertaking depended on the choice of the first book, and I was only then beginning my career as author and editor. But Reclus was our saviour. I resolved to begin the publications of the firm O. Popova with a popular edition of Reclus' "Earth". . . For this purpose a new translation of Reclus' work was made, without any alterations or abridgements of the text. It was carefully edited by me from the scientific point of view, and the style of the translation was rendered as simple as possible. . .
On the eve of the first Russian revolution, I was in exile under strict police supervision, and in 1908 I settled in Switzerland, continuing my publishing activity from afar... During the Russian revolution other works of Reclus, among which were included his works on anarchism, appeared and were widly circulated. Before 1905 they penetrated into Russia, but only as pamphlets printed abroad, but this happened rarely as it was dangerous to smuggle them in and many, both revolutionists and ordinary readers, were punished for possessing them. Various revolutionary groups managed to smuggle in some forbidden works, among them Reclus' Anarchism, exposing themselves to the danger of being condemned to death. In 1906 that pamphlet ["Evolution and Anarchical Ideal", translated by Prof. A. Borovos] was several times reprinted in Russia, without submitting the book to the censor. The police tried to seize these works, but it was useless. A printer would come to the censor's office, according to Russian law, and declare that in his house such and such work of Reclus was to be printed by so and so; the next day the police would invade the printer's-workshop, and seize some 200 copies of the dangerous book, whilst 5,800 or 9,800 other copies had already been carried away, nobody knew by whom and where to, or else had been beforehand secreted by the publisher who himself was hidden, and soon after they were spread all over the country. 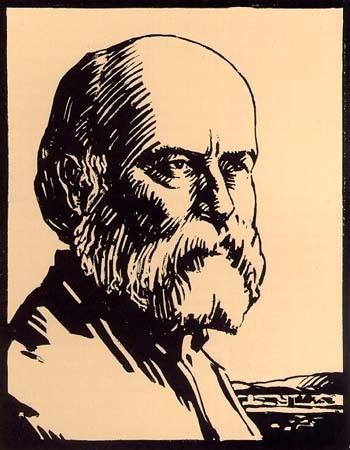 Thanks to this the name of Reclus became known to the Russian people, from another view-point, not only as a scientific-anarchist, not only as a geographer-anarchist, but also as a fighter-anarchist. We can judge how popular Elisée Reclus had become in Russia by the fact that in 1909-1910 a third translation of the same "Earth" appeared at the firm of Cytin, a talented propagator of fine books. This new and improved edition at Cytin's came out as a premium to his weekly journal, "Round the World" of which at least 30,000 copies were sold weekly. Every subscriber received a premium without any extra payment, the whole work, in two richly illustrated volumes. As the journal, "Round the World", circulated throughout Russia, even in the farthest corners of that vastland, teeing reed by tradesmen, peasants, workingmen, clergymen, scholars and students, so it can be seen to what extent the works of Reclus penetrated into the masses of the Russian population. It seems to me that there is no other country in which the works of Reclus circulated in numbers of 30,000 copies in one year. Besides this, Cytin sold independently of the journal large quantities of the work at 3 roubles. . . The reports of the libraries published up to 1917 prove the great demand for Reclus' works among the reading public. To make certain of this, one need only glance at the statistics of books read in the geographical division into which most of the works of Reclus are placed. Thus in the report of the important public library of Nicolaiev, a large town near Odessa, we find thatin 1910-lpll Reclus' works occupy the first place, if one does not take into account a geographical text book recommended by a teacher of the upper school. . . Thus do facts confirm the common feeling existing between the Russian readers and the internationalist, anarchist author: the laws of bibliological psychology are the same laws as those of the science of nature, i.e., the laws of nature. The history of the works of Reclus in Russian translations confirms once more the idea expressed already long ago, that in the soul of the Russian people there is something of anarchism. 1 E. Hennequin, "La Critique scientifique", Paris, 1884. 2 Dr. N. Roubakine, "Introduction a la psychologie bibliogique", 2 vol., Paris, 1922, Povolozky. 4 This library still exists and is prosperous, having become public property in 1907 (115000 volumes).